Most of the time when I write a post, I feel inspired by a feeling, a thought, or an experience. Today I feel the need to write because of the significance of the date on the calendar and what it means in our story, but honestly I just feel numb. When we experienced our first baby's expected due date, I had much to say. Today, I just don't know what to say. There's something different about experiencing this for a second time. Part of it is simply because I have been here before. There is something about the unknown that is terrifying - at least for me. As our first baby's due date was approaching, I was afraid. I was afraid I would not survive. I was afraid of the emptiness. I was afraid of the sadness. I was afraid of the brokenness. However, once you've experienced something before, it's almost as if you don't have to be as afraid. You know you can survive because you have before. And that's how I've felt leading up to today. I knew it was coming, but I also knew God would bring me through once again. And He will. I wrote a letter to Baby "J" this morning. 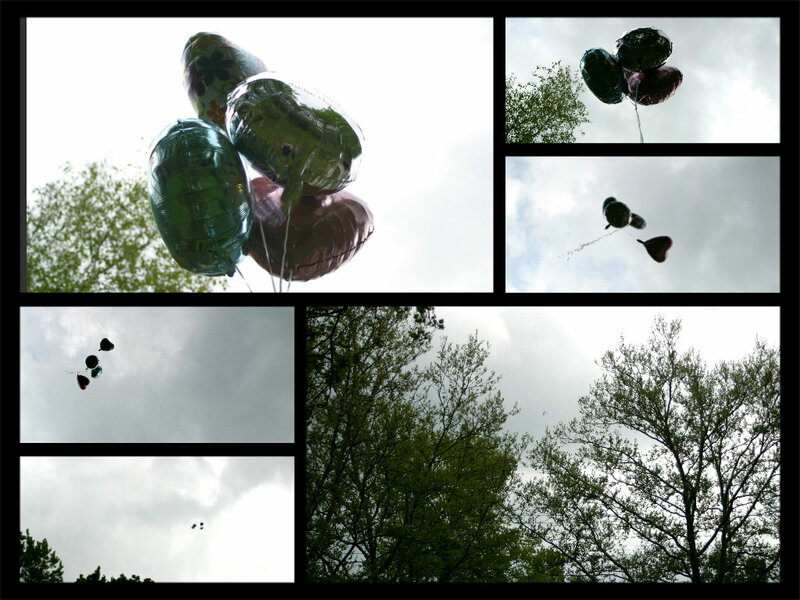 I wanted Baby "J" to know he/she is not forgotten and that he/she is in my thoughts today. I wanted Baby "J" to know what today means to us - the day (or close to it) when we would have been able to meet him/her face to face and hold him/her in our arms. I told Baby "J" how deeply I miss him/her even though we've never met. And this is when I start to feel. Today is so different than what I hoped for or imagined. I remember thinking about how my sister's graduation present would be another niece or nephew and how much I thought she would love that. I remember praying that our baby's birth would not conflict with her graduation ceremony so we could still be there to support her on that important day. I remember dreaming of holding Baby "J" and meeting him/her face to face. I remember my dreams of being able to be a mother in a tangible way. This is the mourning, the grieving. For things are not what we hoped for or imagined. Our lives and our family are not what we hoped for or imagined. Yet even in the midst of this I am grateful. I am thankful for the blessing of being a mother even though it is in a different way than I hoped. I am thankful I have two beautiful babies even though I have not met them yet. I am thankful for family and friends who have and continue to support us on our journey. I am thankful that Hope is never lost. I am thankful that we will be able to see our babies and hold them one day. I am thankful we serve a God who cares. The numbness is wearing off and many thoughts and feelings and memories are flooding into my mind, yet I know I will survive this day. I know God will bring me through the significance of this day once again. Whatever significant days you have yet to face, even though the fear or uncertainty may be great, I hope you can take some comfort in the fact that God cares and He will bring you through. I am thinking of you today. You have been on my heart and in my prayers. I know this day may not look like what you hoped for, dreamed of, longed for, or prayed for. But that does not change the fact that you are a mother. So today I am wishing you a "Happy Mother's Day"! In some ways, your journey as a mother has been one of the most difficult of all. Saying goodbye to a child before you even got a chance to see his or her face is unspeakably painful, and to love furiously in the midst of loss is incredible. You are not forgotten today and neither is your precious child(ren). Even though our children are not in our arms, sitting on our laps, or holding our hands today, it doesn't change the fact that we are mothers. It may look different from the outside, but on the inside our hearts are so full of love for our children who changed us and blessed us with the opportunity to be mothers. Jesus sees you today. He sees your heart - the parts that still hurt, the parts that ache, that parts that long to hold your child(ren), and the parts that remember your child(ren) today. You are not forgotten today and neither is your precious child(ren). You are beautiful. You are mother. A year ago today...I remember waking up with feelings of joy and anticipation even though I stayed in bed a little longer than I should have in an attempt to get a few extra minutes of sleep. I remember putting on my green v-neck boyfriend tee accessorized by my handmade peacock feather earrings. I remember saying goodbye to our house guests just before rushing out the door with my husband, a little behind schedule because of those extra minutes of sleep my body demanded earlier that morning. I remember the delicate medley of excitement and fear as we arrived at my doctor's office and sat in the waiting room. I remember climbing onto that awkwardly uncomfortable sterile bed in preparation for our first ultrasound. I remember feeling the warm ointment as the doctor squeezed it onto my belly. I remember looking away from the screen for fear of my worst nightmare coming to fruition - until the doctor said with reassuring words, "There's your baby." Then...I remember watching her as if she was searching for something that could not be found, and I vividly remember the overwhelming fear of that moment. I remember my despair when the doctor uttered the words: "I cannot find your baby's heartbeat". I remember the car ride to the hospital and the additional ultrasounds to determine if our baby was "viable". I remember that dreadful trip back to the doctor's office to await the ultrasound results. I remember hearing the doctor mumble words that confirmed we had lost of our baby. I remember tightly embracing my husband and leaning on him as I wept uncontrollably. I remember the tears. I remember the pain. I remember the heartache. I remember the brokenness. I remember the emptiness. I remember the numbness. I remember the shattered hopes and dreams. Yet, I remember God's promise to me that He would walk by our side through whatever the future held. I remember the intimacy and closeness my husband and I shared as we wept together. I remember the comfort and love we received from those who dearly love us. 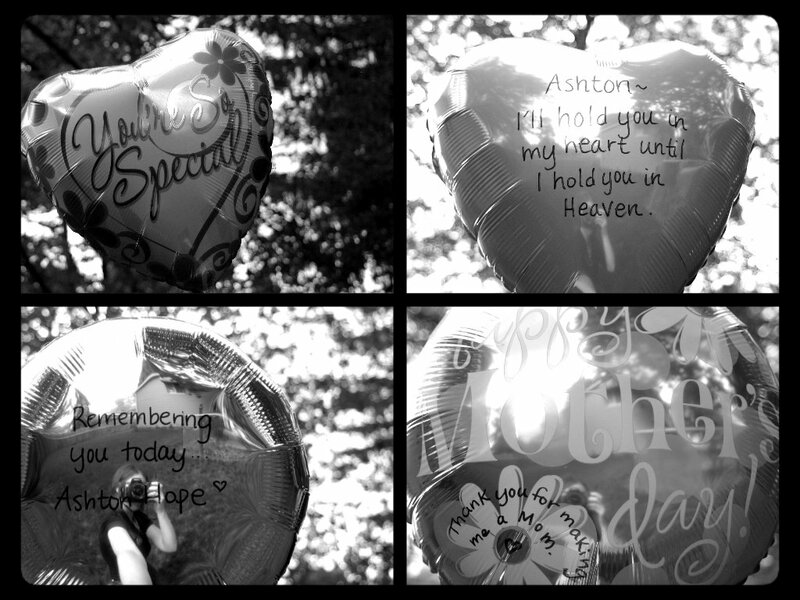 I remember our baby, Ashton Hope. In memory of Ashton today, I chose to release some balloons chosen specifically to display his/her impact on our hearts. During today's events, I remember one moment in particular when I lost my grip on one of the balloons. I remember desperately grasping for the curling ribbon fearing that the balloon would float away before the appropriate time. Then, I remember tears filling my eyes as I stretched out my hand and tightly grabbed the ribbon. For that feeling was all too familiar. The fear of losing something or someone before his or her time, before I was ready to let go. I was not ready to let go. Not in that moment and especially not on that day - a year ago today. But there came a time today when I knew I needed to let go. So I clutched that curling ribbon in my hands one last time and I prayed. Then it began, the process of letting go...one step at a time. As these events unfolded today, the sun was often hidden by the clouds, but for brief moments it would gloriously shine without abandon. Throughout this year, there were days so overcast that the radiant beams of the sun appeared hidden. There were days so dark that it seemed like the light would never shine again. There were days when the pain and heartache and sadness seemed to overshadow any possibility of relief or healing or hope. Yes, there are those days and sometimes there are oh so many. 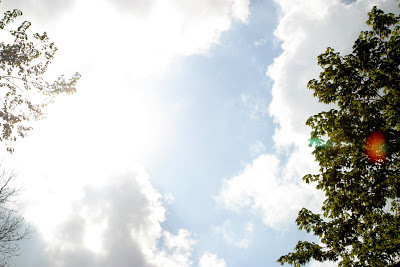 However, the sun always shines even when it is hidden by the clouds. The light always appears even in the darkest moments. And it did today too. There were brief moments in the midst of this overcast and dreary day when God in His grace allowed me to catch glimpses of the radiant sun and feel it's life-giving warmth. The Son always shines and His radiant Light is life-giving even in the midst of the darkest days. Even when it cannot be seen, it still exists. Today, I remember the healing that God has done in my heart since that day - a year ago today and embrace the hope of the Son and His radiant Light. May you catch glimpses of the radiant beams of the Son and the life-giving warmth of His Light even in the midst of your darkest days. And remember even when they cannot be seen, they still exist. As our first child was growing in my womb, love for our baby increased daily. After we found out our baby was gone, I felt like all the love that filled my heart had no where to go. Practically speaking, that is. I had no cheek to kiss. No tiny hand to hold. No smooth skin to touch. No mouth to feed. No practical way to express the love that was overflowing from my heart. As a result, shortly after our loss, I had this overwhelming desire to go to an orphanage and tangibly show love to children there. I wanted a practical way to convey the love that was in my heart. After our second loss, this desire came back with intensity. Four months later, I had the opportunity to hear a speaker talk about children in need and the ministry of Compassion International. My heart was awakened once again and I remember God gently speaking to my heart. A month later I heard another speaker share about the ministry of Compassion International and the needs of children. I knew in that moment that God clearly placed the mission of the ministry on my heart. I loved what I heard - the fact that they provided both physical and spiritual nourishment to children in need, and I was excited about the opportunity to love a child in a practical way - a tangible way to convey the love in my heart. My desire and intention is not, nor has it ever been to replace our babies. Instead, it is to furiously love in their honor. Both times after we conceived, my motherly instincts and innate desire to love and nurture came alive, yet after our babies were gone, I no longer had someone to tangibly love and nurture. The majority of the children who are sponsored through Compassion International have both their fathers and mothers, yet do not have enough financial resources to meet their needs. I have no desire to replace someone's father or mother nor to replace our babies, but I love that the ministry of Compassion International gives people an opportunity to tangibly love, in Jesus' Name, by providing resources to meet the needs of children. Nilver captured our hearts for two primary reasons. First because he had been waiting for a sponsor for more than 200 days, and secondly because his date of birth shares the expected due date of our second baby. I am just simply blessed by this tangible opportunity to love a child in honor and memory of our babies. 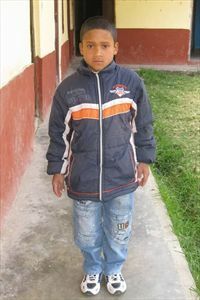 If you are interested in sponsoring a child through Compassion International, please visit their website. It is a unique opportunity to share the love in your heart while honoring and remembering your baby and/or babies.